Most of the information required to get you started regarding the use of the chat application has been listed below. However, if you have more questions then feel free to use the contact form to ask them. You can change or create a new room by typing a room name into the first input field at the top left of the screen. If the activity lists are not visible then you will have to click on the green icon in the very top left corner of the page. You can also enter rooms that are already open and active by clicking/touching the room name on the room-list. Command Method: Simply type room=RoomName into the chat. You can change or create a new user name by typing a name into the second input field at the top left of the screen. If the activity lists are not visible then you will have to click on the green icon in the very top left corner of the page. Command Method: Simply type name=NewName into the chat. To share an image publicly with other users in the chat room will depend on the type of image you want to share. We will cover the most common types and the best ways of sharing them. These are images that are hosted somewhere on the internet, such as your social media site or some other webpage. You can simply copy the image location/address to your clipboard. On an Android device this will mean holding your finger down on the image you want to share and selecting the appropriate options for the given browser. On Desktop you would right click the image and select the correct copy option. Then paste the copied URL into the chat's message input field and press enter to send. You could also drag the image you wish to share to the chat's message input field and the chat application will automatically add the URL to your chat's message input field. These are images that you have found by using the in-chat GIF search panel tool. By clicking on the icon on the bottom tool-bar. Enter a search term or keyword into the Gif Search input text field and press enter. The panel will load in any found gif image results. If you see a Gif Image in the results that you want to share in the chat then simple click the Gif image or images and press enter to share them publicly. These are images you have saved on your computer or device that you want to upload and share. By clicking the icon to open the uploader panel. Click on the dashed box or drag an image into it and the uploading will automatically trigger if you are uploading a valid file-type. Once the upload has complete you will be given a "Send To Chat" button to click on. Simple press enter to send. If your upload is for a single user, then make sure you select 'Private Message' for the given user before hitting enter. These are live images that you can captured directly from your webcam with or without added webcam filters or effects. By clicking on the icon on the bottom tool-bar. Once the Snapshot Panel opens it should ask for permission to access your webcam. If you have a webcam connected you will need to grant access to it to use the Snapshot Panel, otherwise it will automatically close the panel. The Snapshot Panel has five buttons. The 'PNG' button can be toggled from 'PNG' to 'GIF'. This will set the image format, where ".png" is a single frame and ".gif" will capture multiple frames. The chevron left button will toggle previous filters/effects. The chevron right button will toggle next filters/effects. The camera button will either start the time delay and capture on count down complete (if set) or capture immediately. Capturing a single frame when set to 'PNG' or multiple when set to 'GIF'. The timer button will give you the option to set a slight delay before capturing the snapshot. After capturing a snapshot you will see small previews under the controls of the Snapshot panel. Clicking on these previews will send their URLs to the chat's message input field. Simply press enter to send the snapshot to the chat. Like with posting images, the posting of videos is done through several primary methods. Each with their own category. When sharing small video formats like MP4 or WebM video clips found on sites such as Imgur.Com. Although they are video formats we will treat those videos in the same way we treat posted Gif images (see above). For longer videos that require more attention to watch, so that they don't end up getting pushed out of the chat. We load those into a video player container. These videos are Youtube hosted videos, to share them you simply have to post the Youtube video URL into the chat room. To play them you and other users can click on the Video Links that are created from the Youtube URLs. To make things as easy as possible we also offer an in-chat Youtube Search panel. This panel can be opened by clicking on the icon on the bottom chat tool-bar. Enter a search term or keyword and press enter. From the results returned you will see that they each have a 'Post To Chat' button. When you find the video you want to watch or share, click that button and press enter to send the video to the chat. Other large videos, like full documentaries not hosted within Youtube should be posted as a link to opened in to a new tab or window. These options are generally self-explanatory, but let's briefly list their function for clarity. Private Messages (PMs) are sent only to the user(s) you are PMing and unlike a 'Private Chat' they are posts that display in the current room of the person you are PMing. The 'Private Chat' option sends the user a PM, but along with it is a link to a private room and when sent will open that room automatically as a new tab within your chat page. Should the PMed user click your private chat link, you will then both be in the same private room/tab together. Private rooms (all rooms starting with 'pvt') will have a shorter post life and a smaller post count when loading the room's post history, this is to increase privacy in the unlikely event of two different private chat requests generating the same room link. The 'Friend User' option will push the user(s) to the top of the user list and tag them with the green light icon. The 'Disable User' option will tag users with the orange light icon in the user list, disable their HTML (should Format be set to on - see more below). It will also turn their images into links (assuming you have images on) and set their font to small. Finally disabled users are marked with an asterisk character next to their name. The 'Ignore User' option will remove all of their past and future posts from the chat, mark them on the user list with a red light icon and push their name to the bottom of the user list. 'xxxx History' (where 'xxxx' represents the user's ID) will allow you to view the post history in a new side window of all/any user(s) associated with that ID. 'Delete Post' will remove that specific post from the chat. Note that if the post you are removing is your own then it will also remove it from the server (post history - see above) and all other users in that room. Clicking on the 'Gear' or 'Cog' icon within the side tool-bar will open up the chat settings tool-panel. In this section we will not cover the the "EDIT TAG" button, but you can view details on that under the Alias Tag Editing sections. On: display all full sized images posted by non-disabled users. Small: Scale down the size of all large images and display them if a user is not disabled. Off: Turn off all posted images and display them only as links. On: Allow other users to display their own selected tag colors. Off: Display my own chat foreground and background color theme selection for all chat posts. On: Allow the parsing of HTML and the use of Advanced HTML Alias Tags by other users. Off: Disable the use of HTML posting and Advanced HTML Alias Tags. On: Make all chat posts background colors transparent. Off: Allow other users to display their own selected tag colors. On: Show users names for default alias tags. Off: Hide user names from default alias tags. On: Set borders between chat posts. Off: Do not set borders between chat posts. All: Play the small loon sound when any new post is added to the chat. PMs: Play the small loon sound when a user Private Messages you. Off: Never play the small loon sound. On: Allow emoticons to display. Off: Turn off the display of emoticons (This does not affect emojis). On: Display my own tag foreground and background color selection for all users posts. 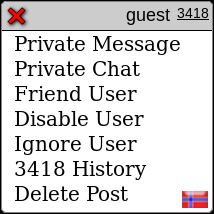 High: Display the maximum number of users chat posts. Medium: Display fewer users chat posts. Low: Display the minimum number of chat posts - ideal for mobile users. The Basic Tag Alias is the most commonly used Alias Tag, this is possibly because most chatters do not know HTML or because they like to keep things simple. In any event it is worth knowing that even if you do use an Advanced HTML Alias Tag, many of your Basic Alias Tag settings will be used should a user have format turned off. Therefore it is worth setting up the Basic Alias Tag correctly. For example, if you set both background, name and foreground colors to black and other users have format off, even though your advanced HTML tag is overriding these settings, they are likely to ignore you as your chat posts will show up as a solid black line for those users. Clicking on the 'Gear' or 'Cog' icon within the side tool-bar will open up the chat settings tool-panel, where you will see an "EDIT TAG" button. Clicking on that button should open an Alias Tag editing panel. Similar to the one pictured below. 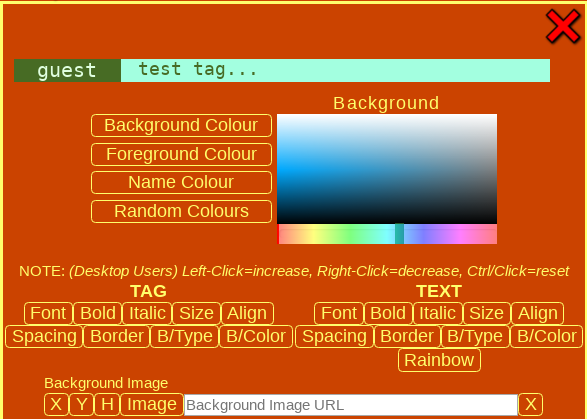 Set the colour picker's focus to the background colour of the TEXT section of the tag and then select a colour from the colour picker to change it. Set the colour picker's focus to the text colour of the TEXT section of the tag and then select a colour from the colour picker to change it. The foreground colour off the TEXT section is also used as the background colour of the NAME section. Set the colour picker's focus to the text colour of the NAME section of the tag and then select a colour from the colour picker to change it. Leaves your colour options up to chance and applies a random colour to all of them. The following buttons apply to both NAME and TEXT. 'NAME' being the first Table Divide and 'TEXT' being the second Table Divide of the HTML Table that creates your Basic Alias Tag. Cycle through a selection of fonts to apply to the text within the section. Such as Arial or Courier. Changes the size of the font within the section. Text aligns the text inside the section to either left, right or center. Sets the letter spacing on the text inside the section. Add or remove the border, as well as changing the size of the border. Cycle through different border types, such as dashed or dotted. Cycle through different border colours. The following button applies only to the 'TEXT' section of both your Basic Alias Tag and your HTML Alias Tag. Add or remove rainbow text from the section. With rainbow text on it is highly recommended that you use this with either a white on black background for readability. To set a background image to the 'NAME' section, enter an image URL for the image you would like to user in the 'Background Image URL' text field and press the 'Image' button to update it. Sets the X position of your background image. Sets the Y position of your background image. Sets the height of your 'NAME' section to hide or display more of your background image. Updates the background image URL value. Clears the background image URL value and resets back to default values. For those of you that know your HTML and CSS and do not need to generate styles with the Basic Alias Tag editing tools. You can use the provided textarea to enter your own custom Advanced HTML Alias Tag. If you are still learning and would like help trying out an HTML Alias Tag, then check out our Tag Help page for examples after reading this section. Clicking on the 'Gear' or 'Cog' icon within the side tool-bar will open up the chat settings tool-panel, where you will see an "EDIT TAG" button. Clicking on that button should open an Alias Tag editing panel. On the bottom half of that panel you will see a textarea similar to the one pictured below. Enter your HTML into the textarea as shown above. Note that you need to add a '$v$' token, this token is replaced by the text that you post into the chat. You can optionally add a '$n$' token, which will be replaced by your username when the tag is used in a post. The reset button will clear out any HTML currently in the textarea to an 'empty tag'. 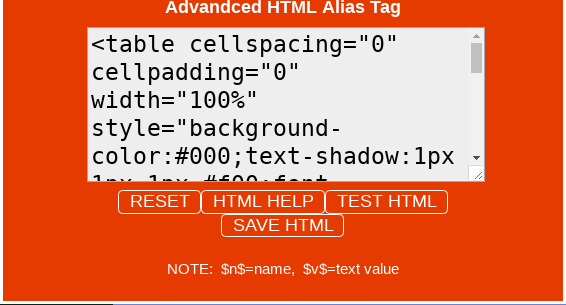 The test button allows you to view and try your current in progress HTML Alias Tag. The save button will save your HTML Alias Tag once you are happy with it, make sure you press this button when you are done editing. The help button will open a page containing examples of HTML Alias Tags and how to use them. eg: "myroom" Default = "main". Any UTF8 string of a minimum length of 1 and a maximum length of 20. This will set the room that you are chatting in. eg: "bob" Default = "guest". Any UTF8 string of a minimum length of 1 and a maximum length of 20. This will set the username that you are using in the chatroom. eg: "myprefix" Default = "main". Any UTF8 string of a minimum length of 1 and a maximum length of 20. This will create a completely new prefix or instance of the chat application. eg: "%23FF0000" Default = N/A. Set the background of the chat application. This can be an image or a color (If HEX then the Hash '#' must be encoded ie: '%23'). Note that when this it set the background colors of users posts are set to transparent. This however can be overridden by setting the bgs value (see below) to 'on'. on Default = 0. To force users posts to have background colors turned on, this value can be set to 'on'. 2 | small Default = 1 or "on". Set the action to be taken on posted images. Either off, on or resized small. 2 | high Default = 2 or "high". Set the default maximum amount of posts that should be displayed within the chat room. 1 | on Default = 1. Set whether other users basic Alias Tags display their own colors or your colors. Set to 0 or "off" to turn off their colors.